How much does it cost to travel to Copacabana? How much money will you need in Copacabana? $b120 ($17) is the average daily price for traveling in Copacabana. The average price of food for one day is $b62 ($8.94). The average price of a hotel for a couple is $b67 ($9.64). Additional pricing is in the table below. These average travel prices have been collected from other travelers to help you plan your own travel budget. How much money do I need for Copacabana? Copacabana, Bolivia, is a small, bright and enchanting town located on the Bolivian shore of Lake Titicaca, the world's highest navigable lake. Situated relatively close to the capital of La Paz, it is a popular resort mostly destination for foreign travellers, meaning that you may feel like there are more Argentinians and Americans than locals. 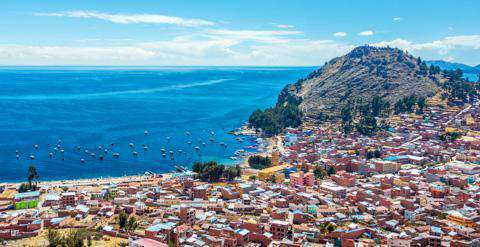 Copacabana is the perfect jump-off point for visiting Isla del Sol and Isla de la Luna and makes a pleasant stopover between La Paz and Puno or Cusco. Featuring beautiful nature walks, ancient sites, stunning sunsets and quaint little restaurants, Copacabana is a travelers' favorite destination to soak in the panoramic views, savor freshly caught trucha, and explore what the Incas believed to be the birthplace of their empire. Copacabana's most famous attraction is a boat trip to the Isla del Sol, which has some of Bolivia's most breathtaking scenery. If you want to grasp the sheer magnitude of Lake Titicaca, take a boat trip to discover ancient Inca ruins scattered throughout the island. You will pass by Aymara villagers busy farming the land and tending to the sacred sites. Visit Copacabana's famous sixteenth-century cathedral, the Basilica de Virgen de la Candelaria. It is impossible to miss this stark white building, home to one of the most precious objects in Bolivia. Locals believe that if the statue honoring Our Lady of Copacabana is taken outside, there is a real risk that Lake Titicaca will flood the town. While it has nothing similar to its Brazilian cousin, Copacabana's waterfront is still a great place to wander around on a warm day. As you walk along the esplanade, you will see two giant Inca statues at the end. You can also pedal along the lake using a rented swan boat or enjoy a cold beer at one of the nearby rooftop bars. Head to the Museo del Poncho, a small yet welcoming museum dedicated to textiles and weavings throughout the Bolivian Andes. The exhibits are spread over two floors, labelled in English and Spanish and provide a fascinating look into the country's many varieties of poncho. A small shop is attached to the museum selling gorgeous ponchos made by local artisans. Opened from Monday to Saturday from 10h to 17h30 and Sunday from 10h30 to 16h, the museum entrance is USD$2 US. You can also hike to Yampupata, a pleasant, yet relatively unknown activity in Copacabana. The sleepy town of Yampupata is 20 km away from Copacabana, a 4 to 5 hour hike. Heading north out of town, follow the road along Lake Titicaca, passing a number of small villages, empty ruins and llamas along the way. The hike is a great way to observe how the local farmers and fishermen in the area live. If you do plan to do this hike and haven't quite adjusted to the altitude, make sure to take it slowly as Copacabana lies about 3800 meters (12,602 feet) above sea level. You can also hike to the Cerro Calvario, a short but steep walk, perfect to understand the layout of Copacabana and the surrounding region. The trail begins on the northern end of town near the red chapel at the end of Calle Destacamento 211 and climbs past the 14 Stations of the Cross. After a 35 minute hike to the summit, you will be rewarded with breathtaking views over Lake Titicaca, made even more spectacular if you get there for sunset. Fish lovers are in for a treat with Copacabana serving up some of the freshest trucha in all of Bolivia. You will find plenty of great restaurants serving trout caught straight from the waters of Lake Titicaca, on the lakefront. You can enjoy a big piece of fish, rice, salad and a side of chips for around USD$4 in most of these restaurants. Many of the restaurants around town also feature trout on their menu but usually at a higher price. Most of the restaurants in Copacabana are catered towards tourists, so if fish is not your thing, you will also find plenty of international cuisine such as pizza, burgers, pastas with a couple of Bolivian dishes thrown in for good measure. You will rapidly see that to travel Bolivia, you will have to take a lot of buses, even if you decide to fly into the country. The closest airports are El Alto (La Paz) or Juliaca (Peru). From El Alto, you can take a 10 minutes taxi ride to the minibus stop on Avenida Juan Pablo II near the intersection of Avenida Alfonso Ugarte, then take a 3h minibus from there to Copacabana. This is much quicker than going all the way down into La Paz and to the Cementerio Terminal, where you will also find buses to Copacabana. Buses arrive in Copacabana at Plaza 2 de Febrero and leave from Plaza Sucre. From Juliaca in Peru, where you can find cheap domestic flights from Lima on Avianca for about USD$50, take a 1h bus to Puno, then change to a bus to Copacabana, which is about another 3 hours, depending on the time of day and how long the border crossing takes. There are also new direct buses to Copacabana called Bolivia Hop. They can bring you straight into Copacabana from La Paz, Puno or Cusco. This service allows you to hop on or hop off at any of these places and provide passenger assistance in Spanish and English at the border. Two great sights in Copacabana are the Copacabana Cathedral and the Museo del Poncho. The Cathedral was finished in 1619 and is a good example of Moorish architecture. The La Virgen de la Candelaria or "Dark Virgin" statue is said to have healing potential. The Museo del Poncho, has on display various items including weavings and clothing from the Andean communities. It has a detailed exhibit on the role of the poncho in defining personality and social status.